Often in conversation with B2B business owners one detects skepticism that content marketing is appropriate for B2B marketing. That skepticism tends to bubble up especially when the topics of social media, video and images arise. I get it. This is indeed a different approach than spitting out tech specs. But maybe the issue is perspective rather than marketing method. 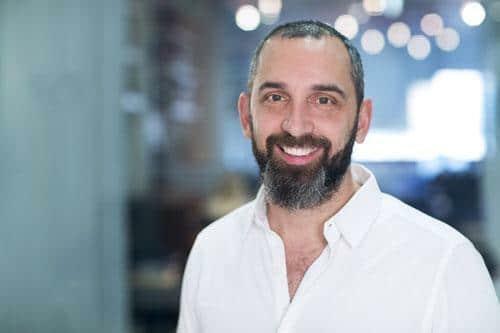 Joe Chernov, VP of Content at HubSpot suggests that were one to boil all of the content marketing universe down into 5 fundamental truths, among those would be the importance of B2B marketing mimicking B2C. Implausible you think? Actually no. And here's why it's critically important. B2B buying has morphed dramatically over the past several years. (More on that in my book here.) While it used to be that the interaction was controlled by a direct sales person in personal engagement with a prospect, it is now a virtual engagement. Research indicates that buyers are not inclined to entertain sales rep contact until their buying process is nearly 70% complete. 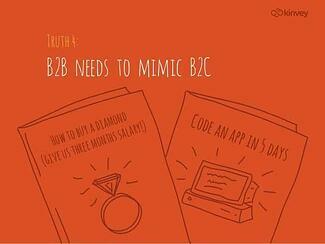 B2B marketing must now serve much the same purpose as toy, cereal, car or jewelry B2C marketing. The emotional engagement (after all, every buying decision is based on emotion and justified with 'logic') must be created virtually - the discourse and connection with a sales rep doesn't occur as it used to. Therefore, from a pragmatic perspective, Chernov's absolutely right. But that's a pretty tough transition for folks accustomed to sterile, product focused, corporate speak B2B marketing. It can even feel cheesy - actually, if it's not done right it can be cheesy! What's the key to the transition? B2B marketers need to learn to share a story. As buyers move through the stages of their buying journey there are chapters to craft. As they move from stage to stage, or chapter to chapter, the entire story unfolds. The 'story' must naturally morph the abstract into concrete - and do so in a way that benefits the prospect rather than serves the seller's preconceptions. Maybe your CMO would be better known as the "Chief Instantiating Officer"! Obviously there's a natural progression inherent in the buying process. But B2B marketers need to understand that their story telling isn't always received in an orderly, Robert McKee Story sort of way. Sometimes it will be chaotic - with elements plugged in arbitrarily by time-starved buyers. And therein lies one of the biggest challenges of marketing for B2B manufacturers. Not only are their carefully scripted direct sales reps not offered an opportunity to the story anymore, but the story is far more nuanced and complex than it used to be. And it is consumed by people in chunks and pieces - almost randomly. Some will read an article, some will see an image, some will click on a video and some may be intrigued by an infographic. They'll drop into the process at random points. And a company's marketing strategy and tools must be sophisticated enough to understand what that behavior means, and how to naturally provide a preview of the next chapter to that prospect in a form which they will appreciate. Want to learn more about how B2B Sales & Marketing are evolving? Download the book now.